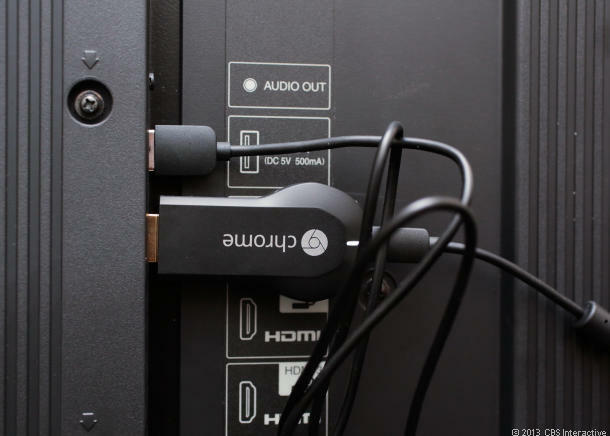 Recently, I mentioned getting a Google Chromecast and said that I might not keep it. Not that it's not a good device, but that it doesn't bring a lot to the table. I'm rethinking that. So, I'm gonna tell you why, but also mentioned another set of issues that, if you're thinking about one, you might want to keep in mind. First, why I'm thinking about keeping it: ESPN3. Sure, it also allows the viewing of Hulu standard/free content on your TV -- remember, this device allows you to extend a browser tab to your TV screen in addition to your computer screen -- but I really don't like the idea of using a computer to watch TV. Two years ago, I bought an Xbox just for the purpose of watching ESPN3. No Xbox video games, just for watching ESPN3. Only, that means a yearly subscription to Xbox Live Gold, which is $60/year (yes, they are on sale from time to time). And, renewal is coming up within a month. So, for a $35 one-time cost, I can replace my Xbox and its $60 yearly cost -- and not have to have wires/cables strung across the room for using the computer. So, Google Chromecast does bring that to the table. And I'm now thinking that's enough. The Xbox will be retired, and the Chromecast will take that slot. I saw another person using Google Chromecast and experiencing some issues. They show they were streaming was not smooth. It was slightly stuttering. Looking at the stream through the computer, not streaming it to Chromecast, everything looked fine. But streaming introduced the jumpiness. Audio was fine, just the image. I didn't have those issues, but I'm using a different computer. Mine's a 2.66 GHz Intel Core i7 with 8 GB of RAM. Even three years old, that's not a bad computer. I don't know the specs of my friend's computer, but it's a recent Windows 8 machine. I don't know the processor or the speed, and there wasn't time to do proper diagnostics beyond seeing that only half the RAM was in use when streaming from the browser to the Chromecast. CPU usage, though, was at around 50% when watching in the browser, but 99% when streaming to the Chromecast. I've looked at the Chromecast Website and can't find recommended specs for a computer to stream to the device.I finally found the minimum system requirements: For Windows 7 or 8, a Core i3 or better is required for a good stream. So, here's a warning. While you don't need the top of the line computer to use it smoothly, a lower-end PC might not be able to do the job optimally. Yes, my friend's computer was able to stream, but the jumpiness of the image was noticeable. If you're looking to get into streaming content to your TV, the Google Chromecast is a good option -- and at $35, it's cheap. Just be aware that some perfectly good computers may be otherwise underpowered for optimal use. I'd suggest eschewing wasting money on useless electronics. If you want true entertainment buy another gun. Content doesn't stream from your device. Your device sends the url to the chromecast and it connects thru your home network. so the happiness you saw was due to network / connection speed, not anything to do with the "sending" device. So, closing my browser has no effect? You tried that? And Hulu is okay with their non-Hulu Plus content being sent to a non-computer device? Just to be clear, I'm talking about using the browser to stream content, not the built-in apps for YouTube, Netflix, and Google Play. I was pleasantly surprised with my brand new chromecast. We don't have the best internet, and my computer is over 4 years old but had no problems streaming a movie tonight. Absolutely no stuttering or audio being off. My laptop didn't even get hot, so it makes me think it's not really using my laptop CPU as usually when I watch Netflix my laptop doubles as a heating pad. The difference between chromcasting from a supported app and tabcasting is that in the first case the controlling app is sending an html page to the chromecast 'directing' it to play a stream whereas, in the second case, the controlling app (a chrome tab) is transcoding the stream and directing the chromecast to play the transcoded stream. It should be obvious that the latter case would require a robust network capable of streaming from the source to the director then from the director to the chromecast AND a robust computer to transcode HD. Reducing the resolution of the stream should help eliminate the problems. This, of course, is why Playon streams at 480p.